Got er done it took 2 weeks just evenings and weekends, firebox is 36" diameter and 4' long and the water jacket is 48" diameter 4' long, it holds approx 200gal. I think from your photos that i see a nice wide frame inside the stove where the door is so it looks as though you have made provisions for an insulated door, i am not being critical of your stove at all. i am just pointing this potential problem area if you have missed it. good luck and it's nice to see more folks building their own. willie, on the other side of the door there is a 5/16 plate that comes out 4 inches and is beefed with angle iron, between the plate and the door i will put some sort of insulation to. looks good ..is the back of the firebox in water? or just the sides where are the water line hook ups,only could see in rear on a pic, did you weld in bungs for other things like water level site, temp gauge ,future aux lines.how much insulation can you put round it? rosewood, the back of the firebox is not in water, this boiler is going to be under 10psi so it will alaways b full of water, there are 3 couplings for the main lines on top of the stove in the back and 3 couplings that return the water to the front bottom of the stove. I think im using 2 out of the 3 available. There is a press./temp guage in the front and a temp/relief valve and a honeywell aquastat in the back that will run the solenoid and blower. As far as insulation goes the sides will have 6" at one point b/c it is round but as it continues to round there will be more, and the back has room for 16" and the roof 20", plus there will be 3/4" foil faced foam sheeting which is r5 that will go on the outside of the cage before the metal roofing goes on. is your furnace not vented? is that what you mean by having 10psi. non vent is to scary for me! 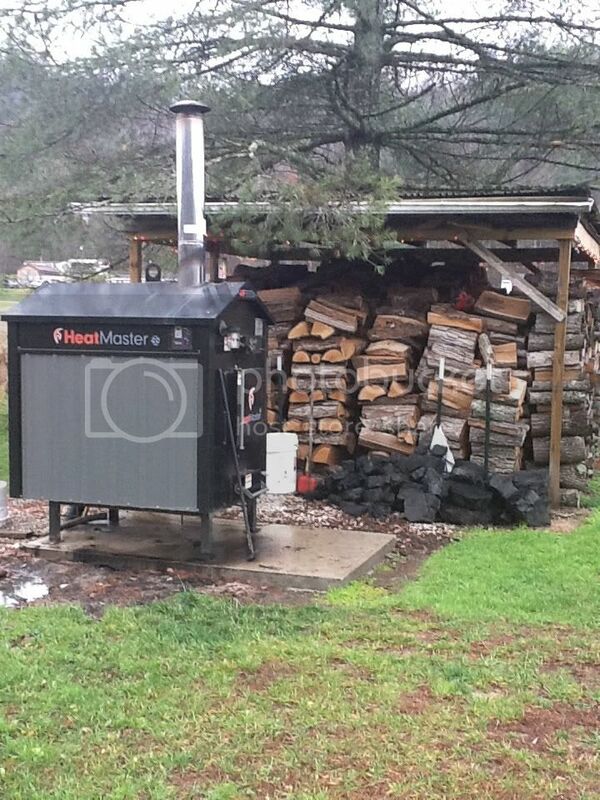 Looks awsome Larson.How much are you heating and how much wood do you use? Thanks woody, Right now im only heating a 1000 sqft and i fill it every three days. I am currently adding on to my house so i will be heating little over 2000 sq.ft proly by january... will see how it works then. thanks scott, well im finally heating my addition without insulation so a total of 2200 sq ft and i can still get 20 hrs between fills. i have infloor heat and when i went to turn on the floor in the addition it froze so it took about two weeks of heating it with an old cast iron radiator before it let loose, doin good tho i just need to get it insulated so i can save some wood.